The final day of my thus far week-long ski trip dawned gray and overcast in Redding, so I figured another leisurely start would be fine. I drove to the NW entrance of Lassen Park, with some occasional sun breaks but eventually into dense clouds and fog near Manzanita Lake. The situation looked bleak, but since the park road was plowed open for 10 miles to the Devastated Area, it was worth taking a look. 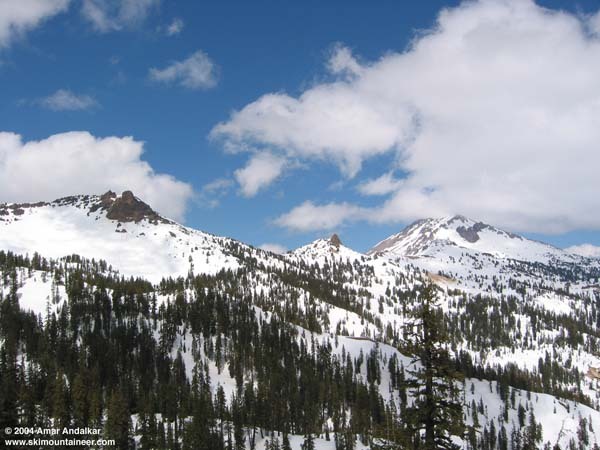 As I drove east, the skies cleared and by 10am at the 6450 ft trailhead, it was completely clear and sunny, with a majestic view of the NE Face of 10457 ft Lassen Peak. Snowdepth was still 5-6 ft there, and one skier had signed out on the register, heading for the summit, but I wasn't so sure. Despite the surprising break in the weather, there was a gusty wind blowing and it seemed unlikely that the steep NE Face could possibly soften on this day with barely an 8000 ft forecast freezing level. I figured that the ski options might be more favorable on south facing slopes, so I headed back west out the NW entrance and followed the winter back road bypass route (SR 44 to Black Butte Road to Wildcat Road to Manton Road to Lanes Valley Road to SR 36) around to the SW entrance of the park and Lassen Chalet. This is a lengthy 80+ mile drive on some very narrow and twisty roads, it would only be 23 miles straight through the park if the Park Road were open, but that is unlikely before mid-May this year. The Lassen Chalet area at 6700 ft still has about 8-10 ft of snowpack, and the park road is plowed bare for several miles past here, but is still gated and closed to vehicles. I didn't feel like hiking up the bare road, so the best option seemed to be to ski the slopes above the former ski area located at the Chalet. Several nice bowls and gullies head up towards Point 8662 on the ridge NE of Brokeoff Mountain. I skinned up at 1pm, on nicely softened snow under partly cloudy but worsening skies. As I neared the ridge crest near 8200 ft, the cold SW wind became stronger and gustier, and the snow surface had remained frozen even on the sunniest south aspects. It was clear that heading up any higher would find only more wind and hard frozen snow, so it was time to ski back down after barely 1:15 out from the parking lot. The south and SE facing slopes were in great shape below the ridge crest, I had some really fine corn once again all the way to the car. But the short 1500 vft run was over within minutes, and the worsening weather meant that I didn't feel like yo-yoing it again. Anyway, I was happy to have just skied something and extended my ski trip for one more day, despite the approaching storm. This view looks NE from my high point on the ridge at 8200 ft, with (left to right) Mount Diller, Pilot Pinnacle, Ski Heil Peak, and Eagle Peak along the ridge, and Lassen Peak at the end. Click here for a double-size version of this photo.